The Ministry of the Environment works on environmental problems in collaboration with citizens, businesses and local governments in Japan together with other countries throughout the world. Main pillars of IYOR 2018 in Japan are the following four points. Through these programs, we would like various parties, such as private companies, NGOs, citizens, researchers, media, and public sectors to collaborate with each other and take actions from each position for coral reef conservation. Activity registration system and Sharing of information on the relevant activities through Facebook. Official supporter system (targeting private companies). 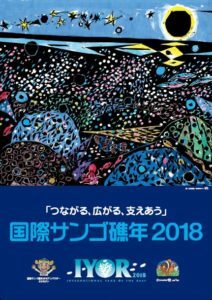 Holding an opening symposium in Tokyo on Jan 28th, 2018. Collaboration with another climate-change program, “COOL CHOICE”.